Jumanji: Welcome to the Jungle opens this Wednesday just in time for the holiday movie rush; but is it kid friendly? Is it as good as the 1st? Keep reading for my spoiler-free review! Jumanji: Welcome to the Jungle is rated PG-13 for good reason. Four high school kids are sent to detention and instead of working they find the old Jumanji game and decide to play just one quick round; however, they are sucked straight into the game. When they are sucked into the game end up being changed into the characters that they choose in the game. While in Jumanji they must complete the game in order to return home, but are met with obstacles, strange clues, and increasing difficulty levels in the game. Prof. Shelly Oberon is played by Jack Black who is really a high school girl. There are lots of male body part jokes and commentary (since it would be her first time seeing/having those parts). The jokes and comments were hilarious, but could be shocking to some kids and families. There was a cute high school romance that is shown throughout the movie, but nothing inappropriate happens other than an awkward french kiss gone wrong. There was also a fair amount of bad language throughout the movie, just about every curse word was used a couple times except the “F” word. The violence in the movie was along the lines of video game violence. The movie was absolutely hilarious and I haven’t laughed this hard at movie in a long time. It was fun to see these big strong guys act like insecure high school kids playing a video game. Dwayne Johnson is really becoming a great actor and Jack Black always cracks me up. The casting was great as was the story. The writers even paid tribute to the Robin Williams character, Alan Parrish, from the first movie. Due to the language and crude humor, I highly suggest parents see the movie before taking their kids. 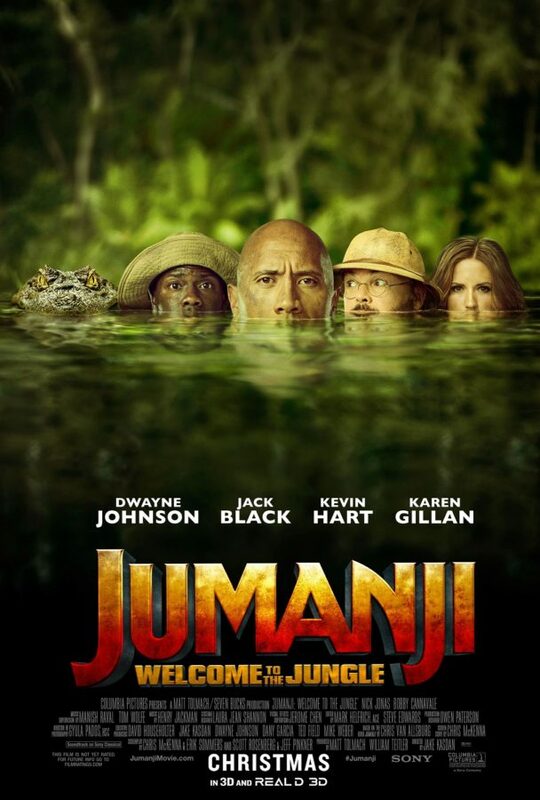 Jumanji: Welcome to the Jungle opens nationwide Wednesday (12/20). There is no stinger during or after the credits.